Gerard is a Templar geek: he has an everyday harmless obsession with medieval warrior monks. He’s got a list of all the Templar sites in Britain, and he’s visiting them, one by one. He’s convinced that the Templars are behind everything, pretty much. But he wants proof, and he’s about to get it during his visit to the Temple Church. This is a sensory story, written with the visually impaired in mind but for anyone to enjoy. Start the walk at the gates to Temple Church, which is located on Temple Street, off Victoria Street. The whole walk takes place within the church precincts. Pass through the gates and walk towards the church. Turn left and walk alongside the church walls to the corner. Turn right, and walk along the east end of the church. Go through a wrought iron gate, and follow the path up three steps and through the churchyard. At a junction, turn right. Walk alongside a herb bed. Take the second path on the right, down six steps to a door in the walls of the church. Turn around, and return up the steps to re-join the main path. Turn right, then follow the path into an avenue of trees. fter the fifth tree on the right, cut across the lawn to a tomb. Sit down. Exit the churchyard via the wrought iron gates at the entrance to the churchyard. Heads & Tales thanks Bristol City Council, Action for Blind People and the Central Library Reading Group for Visually Impaired People for their assistance with the creation of this story. It was recorded by Tony Chamberlain at the studios of Bristol Community FM. 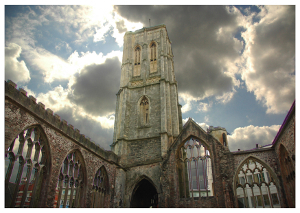 Photograph of Temple Church by William Datson.